NOTE: Pet Me Happy was a home-based business created in 2015 by pet-loving pet parents who formulated and brought to market an all-natural dog treat, Artisan Dog Treats with Oregon Blueberries. While the treats were universally loved, the enterprise was ultimately not successful and the owners shut it down at the end of 2017. This page features 2015-2018 content archived from the Pet Me Happy website at PetMeHappy.com. See the final homepage as archived by the Wayback Machine. We’re pet-loving pet parents who created all-natural Artisan Dog Treats with Oregon Blueberries in our own kitchen at home because we didn’t want to give our pets commercial treats loaded with additives and preservatives. We soon discovered that most other pet parents are also fed up with the harmful preservatives infesting their pet treats and want all-natural treats for their dogs and cats. After their pups tried our first batches of treats and loved them, our neighbors, friends, family, colleagues – everyone encouraged us to share our treats with other pet parents everywhere. We found the perfect artisan baker who wouldn’t compromise our all-natural, made-in-the-USA recipe. So we ordered our first batch of Artisan Dog Treats with Oregon Blueberries and opened our own online store at PetMeHappy.com. 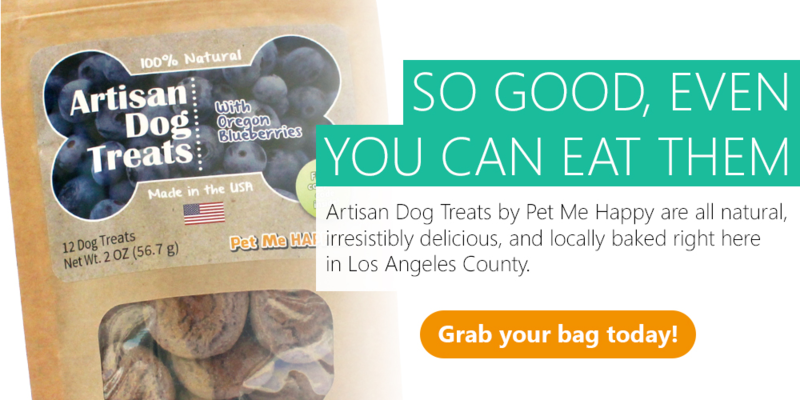 We then introduced Artisan Dog Treats in 2016 at big Santa Clarita events like the KHTS Home & Garden Show, Bark for Life, the Bow-Wows & Meows Pet Fair, Casket Lake, Winterfest and more. 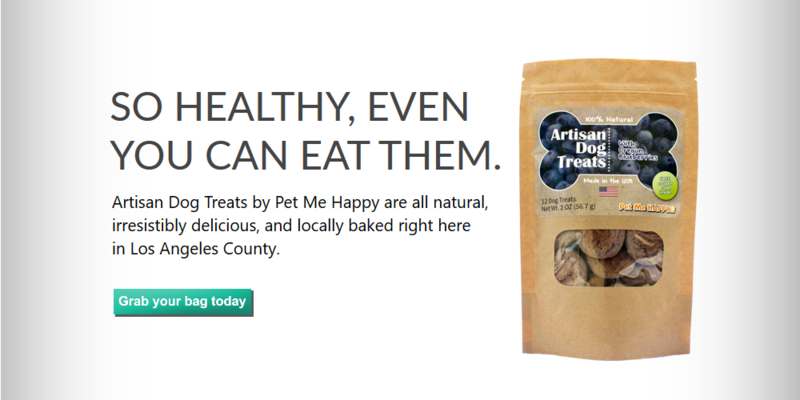 With the support of our early customers online and at events like those, we’ve also started selling our treats through Santa Clarita-area pet stores and veterinarians. Like most pet parents, we think our fur babies are as precious as our human kids. Our pets love and trust us unconditionally, but unhealthy off-the-shelf treats betray that trust. They deserve nothing but the best care and love from us in return. We feel the same way about our friends’ and families’ pets, and now our customers’ pets. 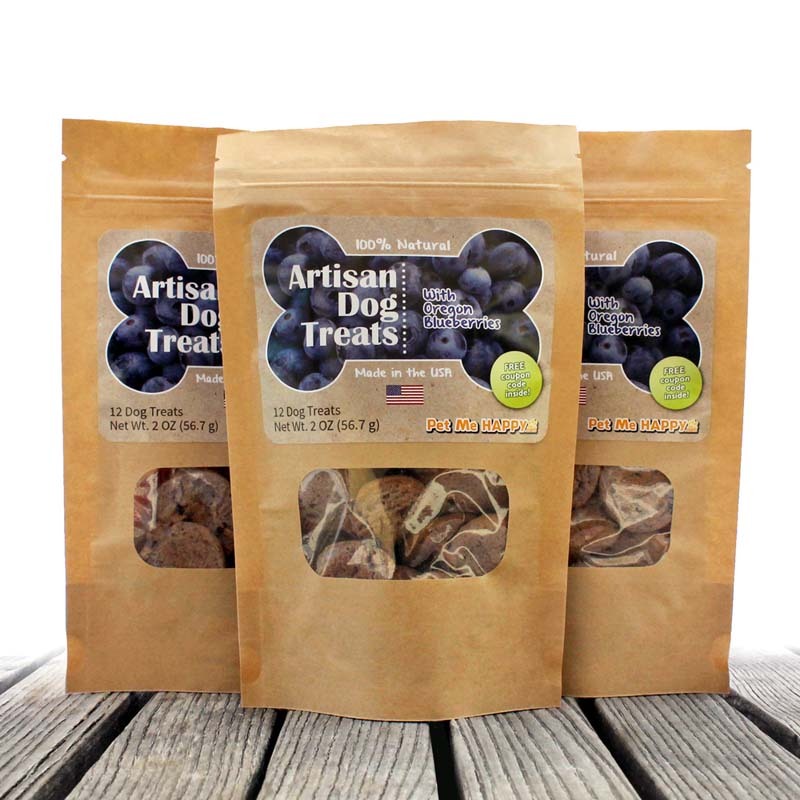 Pet Me Happy features Artisan Dog Treats with Oregon Blueberries in three sizes. We also have Pet Me Happy Gift Cards available in three denominations. We formulated our Artisan Dog Treats with Oregon Blueberries to be so healthy, we could eat them, too – and we do (with a little milk)! 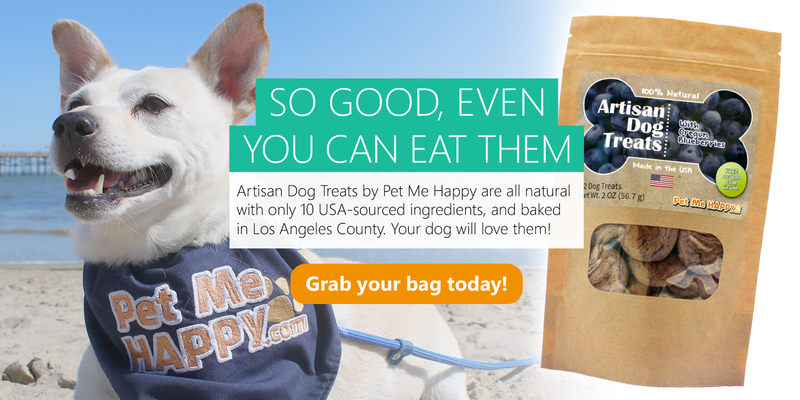 Our Artisan Dog Treats are made from our own proprietary recipe which contains 10 all-natural ingredients exclusively for Pet Me Happy pets. These ingredients are sourced from the U.S.A. and baked by an artisan bakery in Los Angeles County. Starting with the very first batch we baked in our own kitchen, we took more than six months to test, refine and perfect the recipe. Our artisan-baked treats retain the same simple, all-natural wholesomeness as that first batch. The green tea and chamomile help keep dogs calm, which makes our treats especially good for active dogs, and great for training as rewards for good learning. The Vitamin E helps ease discomfort from posterior joint pain, especially in senior dogs. As a side benefit, Vitamin E helps our treats stay fresher, longer. Even better, Artisan Dog Treats with Oregon Blueberries are safe for dogs with sensitive digestive systems (read: no farts!). Blueberry is the first flavor in a complete line of all-natural Artisan Dog Treats that Pet Me Happy will roll out to your furry friend soon. The humans behind Pet Me Happy are life-long pet parents with a passion for animals and are advocates of animal welfare and pet adoption. 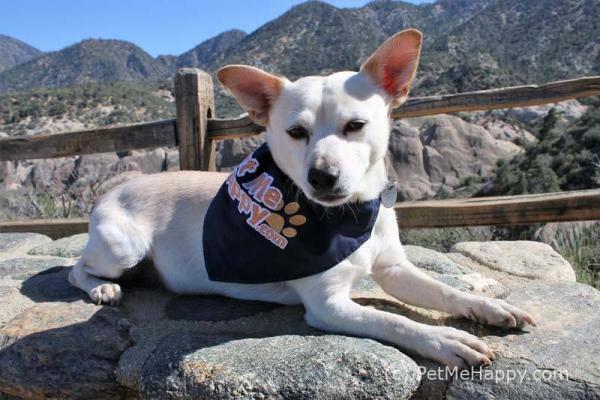 Stephen K. Peeples, a Grammy-nominated producer and longtime Santa Clarita journalist, co-founded Pet Me Happy in summer 2015 with Nadine A. Peeples, his wife and best friend for more than 35 years. They’ve been life-long pet parents and share a deep passion for animals and animal welfare. Pet Me Happy has a pair of official four-legged mascots. 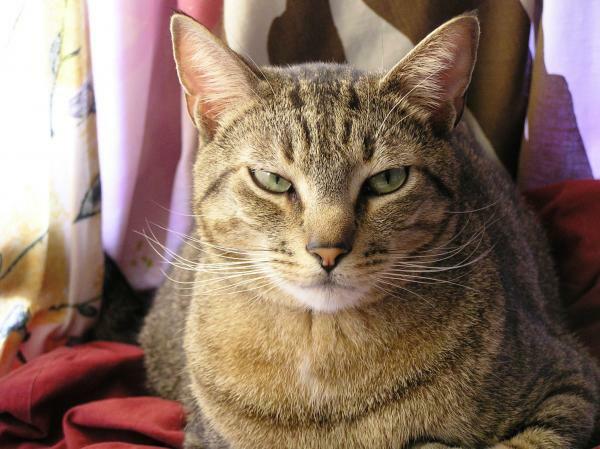 Feline Mascot: Ba tman, a 13-year-old mackerel tabby who thinks he’s human and is upset we call our treats “dog treats” when he enjoys them, too. Stephen and Nadine’s daughter, Veronica, named Batman because as a kitten his ears stuck straight up like Batman’s cowl. Canine Mascot: Lennon is an 8-1/2-year-old chihuahua-terrier mix who is playful but perfectly behaved, and loves Artisan Dog Treats with Oregon Blueberries. Fortunately, Batman gets along fine with Lennon, who was an inmate at L.A. County’s Baldwin Park animal shelter for almost two months before Stephen and Nadine adopted him. That was at the 2016 Bow-Wows & Meows Pet Fair on October 9, John Lennon’s birthday. Stephen said the Pet Me Happy founders have all been lucky to have had wonderful pets all their lives – dogs and cats, mainly. If you’re like Stephen and Nadine, you’ll settle for no less than the best for your pets. It’s the Pet Me Happy way!